Rarely does a single week proclaim so wholly our mission, so fully our name. Looking back a month later, I am still amazed at what we experienced the week of May 13 to 19, and how quickly that week flew by. 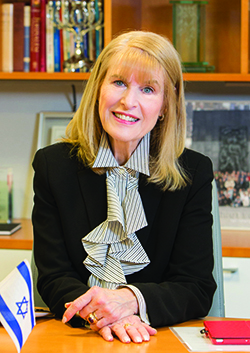 For Hadassah, the Women’s Zionist Organization of America, Inc., focused on health and education in the building of Israel and service to humanity, the week began on a Sunday of convergence—Yom Yerushalayim, the day commemorating the 1967 reunification of Jerusalem; the opening of National Women’s Health Week; and Mother’s Day. Wherever and whenever celebrated, Mother’s Day highlights the role of women in nurturing families and sustaining society. It also reminds Hadassah that the date of the observance in Israel (the 30th Shevat, this year February 15) is tied to Henrietta Szold’s yahrzeit. 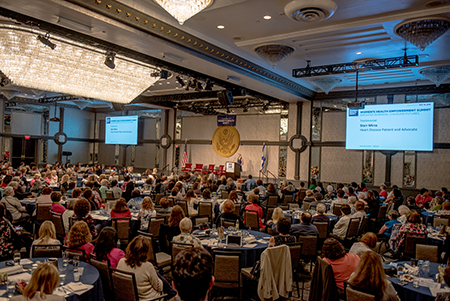 On Monday, May 14, Hadassah met in Washington for our annual National Assembly, followed by our Women’s Health and Advocacy Conference and the second annual Women’s Health Empowerment Summit. Convened by Hadassah, the summit brought together the 28 member organizations of the Coalition for Women’s Health Equity, dedicated to eliminating gender inequities in health care by working toward policy and legislative solutions. Despite careful planning, I had to miss the National Assembly opening. That’s because May 14 was also the 7oth anniversary (on the secular calendar) of Israel’s independence and the day the United States officially moved its embassy from Tel Aviv to Jerusalem. The move fulfilled the Jerusalem Embassy Act, passed by Congress in 1995 with overwhelming bipartisan support, recognizing the city as Israel’s capital. In Washington, Israeli Ambassador Ron Dermer celebrated the day by hosting a special gathering at the Andrew Mellon Auditorium, where he awarded medals to 70 American organizations and individuals who played crucial roles in the founding and flourishing of the Jewish state and the forging of the American-Israeli alliance. The ambassador personally asked me to come because Hadassah was being honored twice—one medal for HWZOA and one for Henrietta Szold. The week’s events brought hundreds of Hadassah women together with like-minded advocates and experts on women’s health. Among the many people who were part of the week were Rear Adm. Susan Blumenthal, a physician, global health expert, former director of the U.S. Office of Women’s Health and assistant surgeon general; Representative Raul Ruiz, a California congressman, physician and key ally on women’s health issues; Fatima Goss Graves, president and CEO of the National Women’s Law Center; and PBS news anchor Judy Woodruff, who moderated a panel on privacy, technology and women’s health information. Our activities took us from the Capital Hilton to the National Press Club to Capitol Hill. A constant theme was that progress in women’s health doesn’t happen by itself. Just as Henrietta Szold didn’t wait for someone else to get rid of the flies she witnessed buzzing around the infected eyes of children in the streets of Jerusalem, so we will not wait for someone else to take on the critical health issues—from prevention, diagnosis and care to discrimination in clinical trials—that affect women disproportionately and too often turn patient experiences into #MeToo occurrences. On Thursday, May 17, we moved from discussion to deeds, as conference participants paid calls on 80 congressional offices, raising Hadassah’s priorities—from women’s health to gun violence, from Holocaust education to support for Israel—with our elected representatives. Everything we did in May can be repeated by Hadassah groups all over America, whether visiting their representatives in Washington as part of our Day on the Hill program or in their home offices as part of our parallel Day in the District initiative. Contact the PRAZE Division for help with tools and training. That auspicious week with its ambitious agenda ended on Shabbat and erev Shavuot, the holiday that celebrates God’s giving the Torah on Mount Sinai and also the wheat harvest. It was a good time for Hadassah to reap the rewards of our own planting, planning and preparation. Those seven days flew by quickly but they will have long-term resonance in the service of Hadassah’s mission and name.